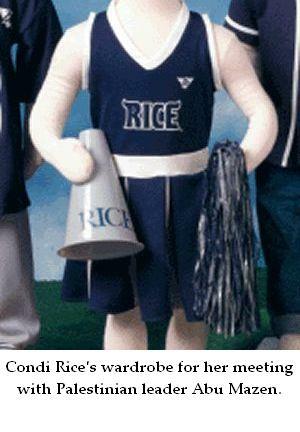 Condoleezza Rice desperately needs a reality check. Standing in Ramallah yesterday with Abu Mazen at her side, the US Secretary of State was practically gushing with praise for the Palestinian leader. Making little more than passing reference to the need for Palestinians to combat terror, she could hardly contain herself in lavishing approval on him in front of the cameras. “I’m honored to be here with President Abbas”, she said. “We applaud President Abbas’ commitment... The United States will stand with President Abbas”. “This is a man of peace,” Rice concluded. “His government is a government that is seeking peace. And it is the goal and the policy of the United States government to support a Palestinian leadership that is, we believe, determined to come to a peaceful resolution of the Israeli-Palestinian conflict,” she said. Needless to say, Rice’s adulation for Abu Mazen has no factual basis in reality. It is little more than a continuation of Bill Clinton’s policy of ignoring Palestinian violations while pressing Israel to make concessions. Indeed, just hours after Rice’s remarks, Palestinian terrorists attacked Israeli troops along the border with Egypt, killing one and injuring two others. And over the weekend, Israeli troops arrested a Palestinian planning to carry out a suicide bombing attack and also uncovered a bomb factory in Palestinian-controlled Jenin. Rice’s reaction to this string of incidents? You guessed it – silence. Why should she let the facts get in the way of her little plan to boost Abu Mazen as a “man of peace”? Israel has been down this road before – and all it led to was increased violence and terrorism. If Condi Rice really thinks that cheerleading for Abu Mazen is a viable policy option, then the former professor needs to go back and review some of the lessons of the past 12 years since Oslo, and stop giving a boost to those who kill Jews.